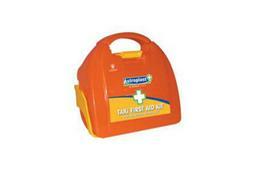 Wallace Cameron vivo taxi first aid kit orange box. This kit contains the essential first aid items for administering first aid. Also includes a resusciade plus a mini clean-up kit for the safe disposal of body fluids such as blood, vomit and urine. The kit has a secure fitting bracket.